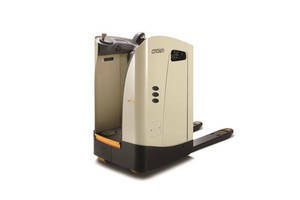 Wallboard Fork offers 6,000 lb capacity. Available in widths to 84 in., Wallboard Fork provides 6,000 lb capacity and comes standard with 360Ã‚° hydraulic rotation and integrated brake. USA-made unit also features matching link, twist-n-lock tines, heavy duty check valve cylinder, and custom color paint. 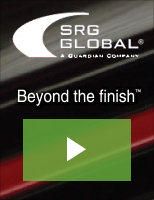 Reach-Fork Truck offers 4-direction travel. 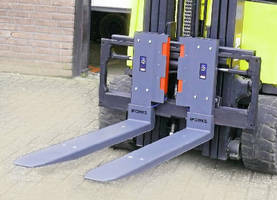 Wireless Scale Forks weigh low pallets. Pallet Forks suit mini skid steers. 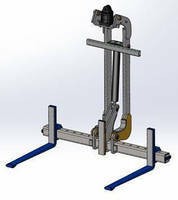 Featuring universal mini mount type, Pallet Forks optimize productivity of Mini Skid Steers and Compact Tool Carriers. Model MPF-900 has 1 x 3 x 31.5 in. forks, mounted on frameÃ‚- that is 30.5 in. 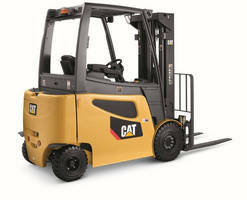 wide with rated capacity of 900 lb. Rail-style Model MPF-2000, rated at 2,000 lb, utilizes Class I tines measuring 1.18 x 3 x 42 in. on 33.25 in. wide frame. 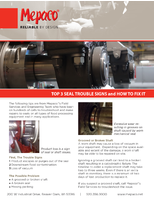 Pallet Forks help maximize productivity. 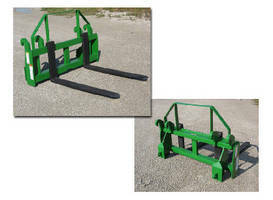 Designed for John Deere H480 loaders with Global Series II tool carrier, Model JDPF-H48048 is rated at 7,500 lb with Class III forksÃ‚- measuring 1.75 x 4.25 x 48 in. Model JDPF-H48060 is also rated at 7,500 lb, but with Class III forks measuring 1.75 x 4.25 x 60 in. 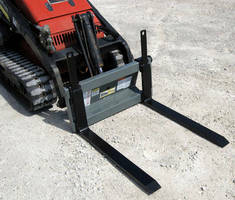 Pallet Forks increase productivity for mini skid steers.